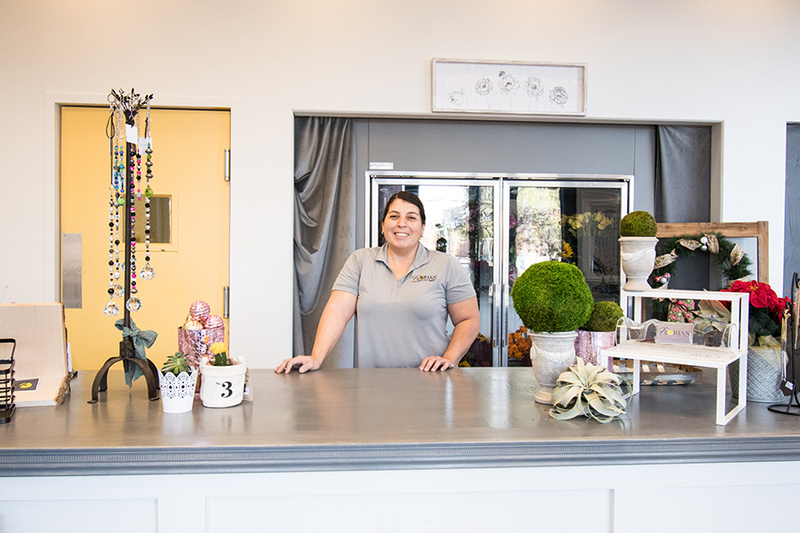 When Aileen Casillas first told her “flower godmothers”—a group of past employers and friends with a combined century in floral experience—that she planned to offer Do-It-Yourself options as part of her full-service floral business, she asked what they thought, whether it was too far-fetched. With that encouragement, support from her family and friends, and a deep love for flowers and floral design, Aileen decided to go for it. In 2005, she attended the Floral Design Institute to earn her certification, leading her to open Florian Floral Design & Event Management out of her home in January 2018. In August, she opened a storefront in the Prescott Gateway Mall. To that end, it’s Aileen’s goal to be a community resource for all things floral. One way to be such a resource: to offer a way for brides who are adventurous or on a budget—or both—to design the flowers for their own weddings. It’s an option Aileen said she hasn’t seen or heard of anywhere else in the country. No matter what, though, she said, it’s important for every bride to accomplish her vision on her wedding day, to create a memorable event that is exactly what she wants it to be. Flowers play a big part. According to a 2014 survey by theknot.com, on average, brides spend $2,141 on floral services for their weddings. Not everyone has thousands of dollars to spend on flowers, though, Aileen pointed out. That’s why Aileen offers a variety of services to brides who want to do their own flowers—including storage and work space rental, flower ordering, delivery, and event management (she offers these services to independent designers, too). She also offers advising because, she said, sometimes people need advice on flower choice, design, timing, preparation, and day-of assembly. “I really just want to help brides accomplish whatever their vision is for their wedding, and to accomplish that vision within their budget,” she said. Her storefront—on the Gateway Mall’s roundabout just outside the food court—includes a retail shop with flower-themed gifts, and a spacious back area, which is broken into several rooms: Aileen’s own design area, a processing room, a work room with tables (each of which gets its own caddy of tools), design books, storage coolers, and supplies. In addition to filling what Aileen considers is a big need in the community, Florian also is the fulfillment of a long-time dream. Aileen has always studied art and design, and has long wanted to open her own floral shop. As life can happen at times, she pursued a career in the fire service to support her three children. Having earned her degree in Fire Science from Yavapai College with multiple additional certifications, flowers were always a part of her. She said it was only after serving five years in the fire service as a Firefighter and Emergency Medical Technician (EMT) that she learned she had the mental strength, resourcefulness, and perseverance to pursue the lifelong dream. Her experience in the fire service and being in the Yarnell Hill fire with everything she went through, she said, brought out something she’d known she’d had, but hadn’t quite recognized. When she finally made her intention clear—announcing it on social media—she said, the pieces came together like magic. It has truly been a blessing, she said. Brides who are interested in reserving Florian storage or work space should contact the shop as soon as they have their wedding date selected so they can ensure their flowers stay fresh. And for those who want full-service from Florian should contact Aileen six to eight months prior to the wedding (although she’s determined to do her best to help with even last-minute requests!). Aileen will have a booth at the Prescott Bridal Affaire Expo Sunday, March 3 from 10 a.m. to 3 p.m. at the Historic Hassayampa Inn. For more information, visit www.florianfloral.com, call 928.778.2755, or email florian.fdem@gmail.com.